Last November, a Spaniard who has traveled the world to photograph olive groves visited Greece. Having seen Corfu and Paxos before, Eduardo Mencos Valdes decided to explore Crete, because he believes it “is the origin, in many ways, of our culture. 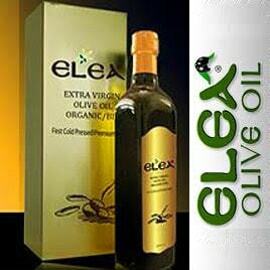 You can trace the cultivation and the importance of olives and olive oil back to the Minoan culture” of Crete. To Mencos, the island “feels like a boat in the middle of the Mediterranean, full of olive trees and olive oil impregnating life.” After photographing olive trees in 17 other countries over the last decade, Mencos felt a greater “sense of time, history, and culture” on Crete than anywhere else. Mencos is well prepared for his mission. He is a landscape designer trained at the Madrid Polytechnic, a tour guide focused on the gardens, olive culture, and olive landscapes of Spain, and a photographer who studied at the American Film Institute. He explained that he always thought the olive tree “was a magical tree—not only magical, but if you want to really get into western culture” (and perhaps other cultures, his travels imply), you need to know about it. 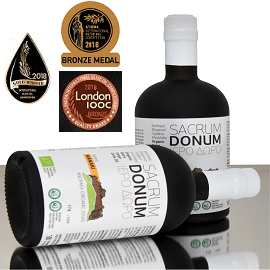 After all, “it’s in the Bible, mentioned hundreds of times,” and if you want to understand the significance of the olive branch, its meaning as a sign of peace, or the history of the Olympics, he told Greek Liquid Gold, you need to know about the olive tree. Even the American eagle holds an olive branch, as Mencos mentioned, in the Great Seal and national coat of arms of the USA. 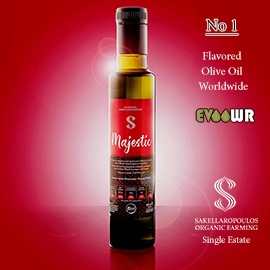 Mencos finds that “people are glad to share the world of olive oil,” welcoming him warmly throughout Europe, the Middle East, and Africa, and even in India and China. He has been struck by “the immense variety and the personality of each country and place I’ve seen -- the immensity of the olive world.” There are differences in the trees, the harvesting process, how olives are eaten, and the flavors and colors of the oil. 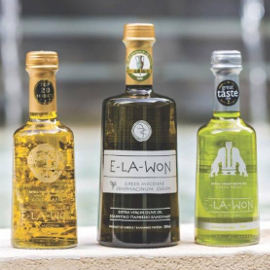 Seeking to learn “what is unique and special about the olive world in Crete,” Mencos met the producer of Pamako olive oil, Eftychis Androulakis, at a modern olive mill in the village of Xamoudochori in the northwestern part of the island. Mencos reported that this innovative young man “made me feel he was breaking new ground” to attain new flavors and create “something unique” with his extensive experimentation. Androulakis told Greek Liquid Gold that Mencos arrived just in time to witness the production of Pamako’s “last olive oil of the season.” Androulakis talked with Mencos “about what we do, our innovation and hard work every year to create a high phenolic, premium organic gourmet olive oil, and how difficult it is to combine all these.” Pamako’s creator explained his innovation in the olive mill, showing how the olives are dried and depitted, how the good olives are separated from the bad ones, and how the inert gas argon is used to keep out oxygen when the oil is stored and bottled. 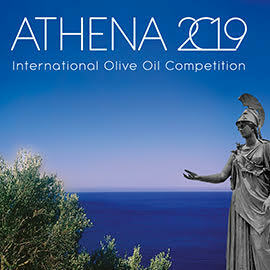 On the Messara Plain in south central Crete, Mencos joined olive oil taster, judge, and producer Irini Kokolaki, who introduced him to her father, Grigoris Kokolakis. They were harvesting olives for their O Olive extra virgin olive oil, surrounded by the autumn colors of deciduous trees. 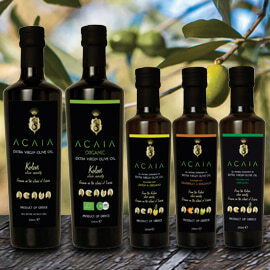 Kokolaki told Greek Liquid Gold that Mencos seemed struck by the contrast “between valley and mountain and sea” in that southernmost olive-growing region of Europe. Mencos said Grigoris Kokolakis seemed like “a man out of Minoan times, loving his trees like more than three thousand years ago.” Impressed by the “personality” of Crete, Mencos enjoyed Irini Kokolaki’s traditional Greek cooking with her own olive oil. Intrigued by the relationship between olive growing and the island’s culture and history, he followed up on Kokolaki’s suggestion that he visit the ancient palace of Knossos and the archaeological museum in Heraklion to deepen his understanding. After just one week, Kokolaki believes, Mencos realized that he needed much more time in Crete, so he hopes to return. Even a focused visit to a single Greek island requires more than a week, especially for those interested in olive oil and the landscapes full of olive groves. Thanks to Irini Kokolaki for the photo of Mencos with her father, and thanks to Eduardo Mencos Valdes for all the other photos.